Produced by Chris Kimsey, "Incommunicado" is an up-tempo, anthemic rock song which peaked at #6 in the UK singles chart. 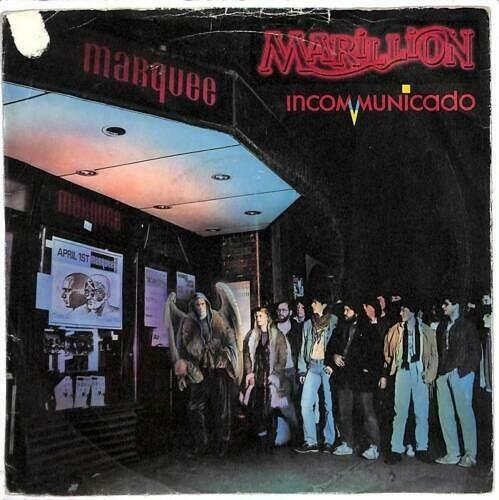 Released on May 11th 1987, this was Marillion's first song to be released from the fourth studio album Clutching At Straws. Two further tracks were released from the same album; Sugar Mice (#22) and Warm Wet Circles (#22). The 7" vinyl single featured "Going Under" (2:44) as the B-side. The 12 inch featured the album version of "Incommunicado" (5:17) as the A-side, with the Alternative Mix (5:57) as track 1 of the B-side. "Going Under" was the second track. The CD single included the same three tracks as the 12", but all on one side, obviously! Incommunicado is a Spanish word which relates to a person who is unable or unwilling to talk with others. It is often used to refer to prisoners who are not allowed to communicate with the outside word. The British rock band's debut album, Script For A Jester's Tear was released in 1983, reaching #7 in the UK album charts. During the 1980's the band had twelve Top 30 hit singles, their biggest being Kayleigh (#2) and Lavender (#5) both featuring on the 1985 album Misplaced Childhood. The band are still performing today and have released 16 studio albums and 35 singles, although with two different frontmen. Between 1981 and 1988 Fish was the band's lead vocalist (he also wrote lyrics and played percussion) but he was replaced in 1989 by Steve Hogarth, who is still with the band today. Marillion have so far released twelve albums with Hogarth.